Rice cooked plain or with other ingredients is a meal on its own. Most people love rice in some form or the other. Today I am going to share my biryani recipe with you. Everyone has a different method of making biryani, be it vegetarian or non vegetarian. Some just let it cook over low heat usually on top of a sigri (jiko, charcoal stove) in a pan, some put it in an earthen pot, seal it and then let the biryani cook. Usually the lid is sealed with a flour dough to retain the flavours and steam. Modern methods are less complicated. Just prepare the layers, cover with a foil and in it goes into the oven. Slow cooked biryanis are much tastier. However, my version is quicker. I prefer to use ghee for this recipe as it makes it more flavourful and the aroma is heavenly. Ghee or clarified butter and all the spices mentioned below are easily available in all indian stores. Wash the rice and soak it in 2 cups of water for 30 minutes. Add milk, saffron, salt, ghee and cardamom powder. Mix well and cook the rice till done. I used a rice cooker but you can use any method that you are use to. The grains should be separate. Once the rice is cooked, take it out into a big tray, separate the grains gently with a fork. Let the rice cool down completely. Heat oil in a wide pan or wok (karai) over low heat. Add the coconut, cinnamon, cloves, star anise, bay leaf and coriander. Stir constantly for 2 minutes. Add poppy seeds,aniseeds, cashew nuts, cumin seeds and cardamom. Stir fry for 1 minute and take the pan off the heat. Let the spices cool down for a bit. Peel and cut the potatoes and carrots about the same size as the peas. Cut the french beans and cauliflower also about the same size. Heat ghee in a pan. When it is hot but not smoking, add the minced onion. Stir fry till it is cooked and the oil begins to separate. Add garlic, ginger and chilli paste. Stir fry for a minute or so. Add the powdered spice mixture, stir and immediately add water and tomato puree. Add the vegetables, salt and sugar. Mix well. Cover the pan and let the vegetables cook over medium heat till done. If the mixture is too watery, open the lid and cook on high heat till the water evaporates. Take the pan off the heat and add the yogurt and mix well. Heat oil in a wok or karai for frying. When it is hot, lower the heat and fry the nuts and raisins. Do not mix and fry. Fry them separately as different nuts take different time to become crunchy. When you fry the nuts and raisins keep stirring the hot oil to allow them to fry evenly. Each type of nuts will not take more than 2 to 3 minutes to fry.Remove the raisins as soon as they plump up. Fry the sliced onions till they become golden brown and crispy. Grease the tray with ghee including the sides. Divide the rice into 2 parts. Spread the one part of the rice evenly into the tray. Add the vegetables and spread it evenly. Sprinkle the chopped coriander and mint over the vegetables. Cover the vegetable layer with the remaining rice. Drizzle the rice with the melted ghee. Sprinkle the top with the fried onions, nuts and raisins. Cover the tray with a foil. Put the tray in the oven and let it bake for 15 to 20 minutes. Serve hot biryani with raita, yogurt or chaas. 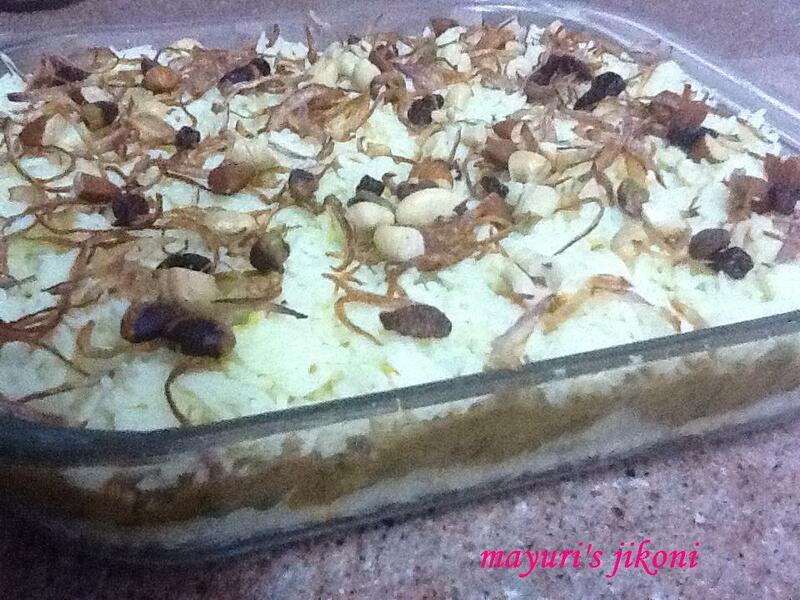 If you want to serve biryani for a party, then keep it ready and bake just before the guests arrive. Make the vegetable a day ahead and keep it in the fridge. The biryani actually tasted so much better the next day. Vary the spices according to your taste. Try and use equal amounts of the vegetables. Can omit poppy seeds as it’s not readily available in most countries.